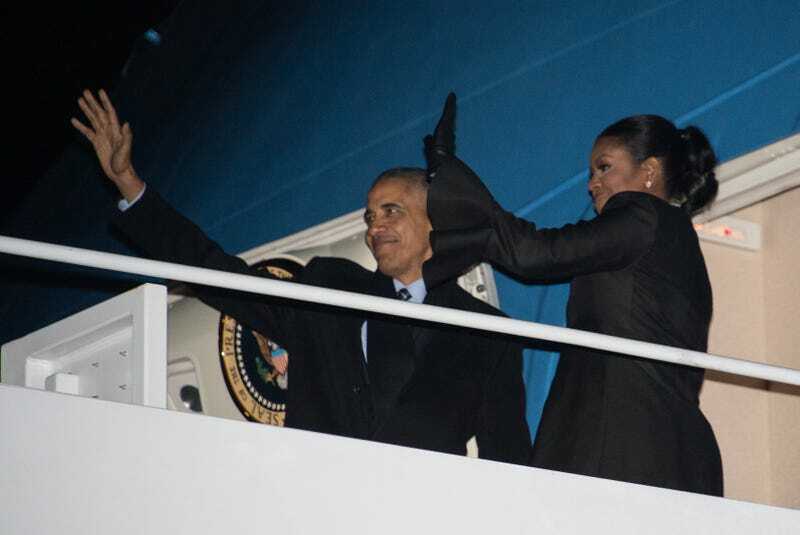 President Barack Obama and first lady Michelle Obama wave before boarding Air Force One at Andrews Air Force Base in Maryland on Dec. 16, 2016, as they depart for their Christmas holiday in Hawaii. As we move closer to the final days of an actual adult presidency, the reality that we're letting go of scandal-free years is starting to set in. President Barack Obama didn't help matters when he announced Monday that he would be delivering his farewell speech in his hometown of Chicago on Jan. 10. "I'm just beginning to write my remarks. But I'm thinking about them as a chance to say thank you for this amazing journey, to celebrate the ways you've changed this country for the better these past eight years, and to offer some thoughts on where we all go from here … I hope you'll join me one last time. Because for me, it's always been about you," Obama wrote. This can't be happening. There should have been an amendment or law or something that allows good, kind, smart presidents to stay in office longer. This is the time that I wish America were under a dictatorship and we had to live with the Obama family forever. I envision the Obamas leaving office with the collective American people, who have at least one working brain cell, clinging to their legs. Hopefully, Sasha or Malia decides to run, and not when they're in their 30s; hell, they're smarter than the president-elect now. I'm annoyed now. Thanks, ’Merica.